We already know that money can be the cause of major problems in a relationship -- but what people might not realize is the extent to which we're not even sharing the information about our finances with our partners. It might come across as less than romantic, but before getting seriously involved with someone -- at least, to their point where their money problems become yours too -- it's necessary to talk dollars and cents. But the fact is, you can't always trust what someone else tells you, even if they're about to commit to you for life. 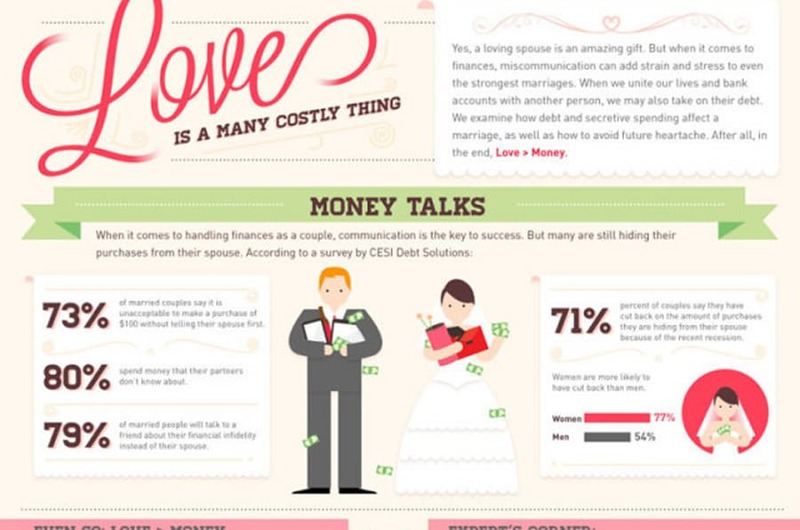 The money-savvy folks at Mint.com have put together a compelling infographic that takes a look at the secretive ways people spend their money. Why not let this serve as a jumping-off point to get the conversation going? While getting this information out in the open doesn't necessarily guarantee living happily ever after, it could save you some cash to help get the fairy tale ending.